Samuel Chandler Parkinson was born February 23, 1853 in St. Louis, Missouri. His parents, English converts to The Church of Jesus Christ of Latter-day Saints, brought him across the plains by wagon team in when he was a baby. The Parkinsons pioneered in Kaysville, Utah, and then Franklin Idaho, where Samuel came of age. 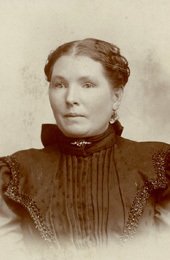 Mary Ann "Polly" Hobbs was also born to LDS converts, in Cheltenham, Gloucestershire, England on August 15, 1855. Her family crossed the oceans and the plains and settled in Franklin in 1862. Samuel got his start as a freighter, and he and Polly later homesteaded a farm in the riverbottom at the foot of the Little Mountain by Franklin. Samuel traveled "without purse or scrip" as an LDS missionary in Alabama in 1884. He and Polly already had six children. Samuel became a successful businesman and later served 13 years as a bishop in Franklin. Polly died December 21, 1912, after which Samuel married Lulu Carpenter. Samuel died May 20, 1922. 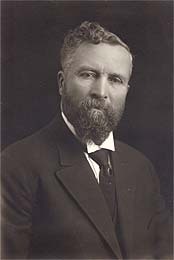 Samuel Rose Parkinson Web Page. Learn more about Samuel's family and genealogy. Hobbs Family Web Page. Learn more about Polly's family and genealogy. Contact Ben Parkinson, webmaster, at "feedback at parkinsonfamily.org" (replace "at" with "@").